Shannon Nangle finished her PhD ready to take on a new challenge and set her sights on research to help make Mars colonization possible. But she isn't pursuing research on rocket fuels or space suits. She's using synthetic biology to improve biomanufacturing of needed resources using simple inputs like sunlight, water, and CO2. In 2015, a collaboration between Pam Silver and Daniel Nocera's lab showed that the bacterium Ralstonia eutropha could be used along with water splitting to create biomass and fusel alcohols. Then in 2016 they followed up with 'bionic leaf 2.0' that used a more biocompatible catalyst to beat the efficiency of natural photosynthesis. Now, the technology has to be expanded and scaled up to take on the many potential applications of an efficient solar to bioproduct technology. To find out about the latest work to help move the bionic leaf out of the lab and maybe one day to Mars, I met with Shannon and graduate student Marika Ziesack, both members of Pam Silver's lab, in their Harvard Medical School lab space. I saw the benchtop setup for testing Ralstonia eutropha with the biocompatible catalysts. A power source connects to the small electrodes that sit in the compartment with the bacteria. As the electricity is applied it splits water–which as H2O has two hydrogens and one oxygen atom– into hydrogen and oxygen. The bacterium, Ralstonia eutropha in this case, can then use that hydrogen along with carbon dioxide to produce biomass like the bio-plastic precursor polymer polyhydroxybutyrate (PHB). Ralstonia eutropha can also be engineered to overproduce certain fatty acids and enzymes that allow for more biopolymers than just PHB. That's one of the improvements that Shannon and Marika are working on so that biopolymers with different structural properties can be produced and used as biodegradable materials here on earth or as renewable building blocks on Mars. Other engineering improvements can be made so the bacteria can tolerate stresses like high salt concentrations that can improve conductivity of the solution. They even mentioned the possibility of a bacterium that can grow in a mixture that includes urine waste to allow more sustainable water recycling. Bacteria grown in a lab or production facility usually need a feedstock of biomass that can end up being the big cost in the bioplastic production. With sunlight, water, and air as inputs it's possible to bypass the expensive feedstocks that would be normally be used to create these bioplastics. To truly tackle applications like space exploration, synthetic biology will need to prove itself in the field. Others have noted that synthetic biology can be crucial to a Mars mission but first it has to get off of a lab bench. 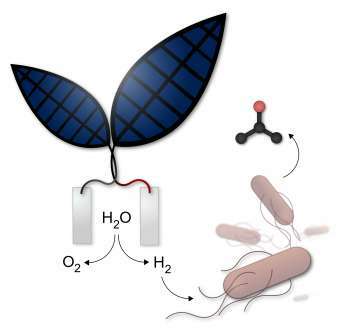 That's why the team at Harvard are working on more portable versions of the bionic leaf to hopefully show that it could work outside of the lab using only resources readily found on Earth or on Mars: solar power, water, and carbon dioxide. Among the many challenges of Mars colonization would be the need to use resources found on Mars instead of bringing everything from Earth. This use of resources found in space is usually referred to as in situ resource utilization, and it would be necessary for long term space missions or colonization. There is a different set of resources out in space than on Earth, but in the last few years NASA has shown that water exists on Mars with frozen deposits reaching the amount of water in Lake Superior. Then if solar power can be used to split that water then hydrogen would be produced and you would just need CO2 to produce bioplastics. 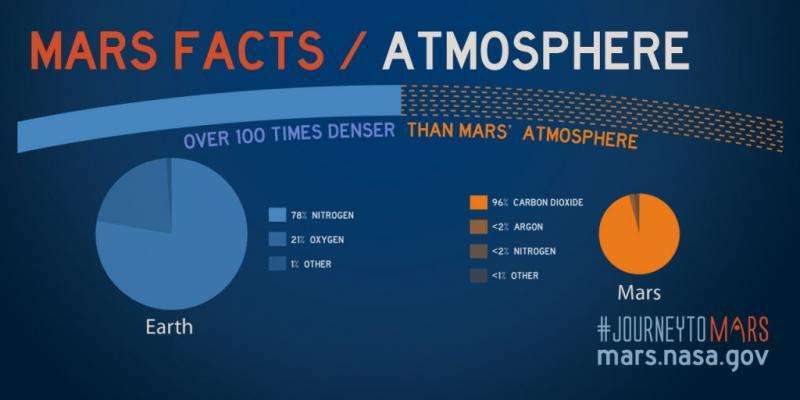 Fortunately, even though Mars' atmosphere is 100 times less dense than on Earth, 96% of it is made up of CO2. So if a technology like synthetic biology can reliably turn water and CO2 into useful materials would be ideal for conditions on Mars. Then once engineered bacteria can convert the in situ resources into something useful like bioplastics, further processing can be done to make needed tools. With bioplastics that can mean 3D printing of products that are made in a renewable fashion with biodegradable materials. So even if this technology never makes it to Mars it may finds ways to replace some of the harsh chemical processes we currently use with biological processes. Biology has already found a way to do many chemical processes extremely efficiently without high heat or harsh chemicals often used in industrial processes. As researchers learn to harness the diverse biological pathways that already exist there will be more opportunities to engineer cells that can replace chemical reactors. More sophisticated models could even lead to predictions of exactly which pathway should be used to meet your final product needs. The possibility of taking advantage of so many capabilities that biology provides is what excites so many over synthetic biology as a technology. But for now, the bionic leaf and other promising synthetic biology tools will have to prove how they can scale and perform in tough conditions outside of the lab. As they do that, synthetic biology researchers like Shannon will be moving us toward the big goals like making Mars colonization possible.